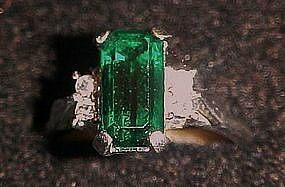 A beautiful Emerald green stone steals the scene on this vintage Avon "Park East" ring issued in 1976. Accented by four sparkling clear rhinestones set in silver. Size 9 1/2. Excellent condition.